Perfect for classroom practice or for an evening of entertainment, middle school and high school teens will easily recognize themselves in these believable — and funny — school situations such as dating, appearances, egos, fads, crushes, breaking rules, embarrassing moments, and more. The characters are daring, outlandish, uninhibited, and creative as they deal with their circumstances that are often exaggerated by their own perceptions, attitudes, and actions. The simple sets and few props make staging quite simple. 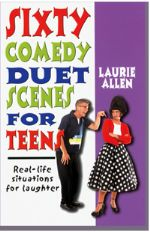 Appropriate for all ages, teens will love reading these scenes and will be even more excited to jump up and perform these comical situations as they develop and show off their talents.